Suzetta, I love it! Thank you for a well done pattern my little girl will love for me to make her. Do you have a stitch gauge? Lately when I use the recommended yarn and hook, my item comes out too large. This ice skating outfit is cute . However my niece has the doll in Connecticut and I am in Florida. I am afraid without a gauge the size would be off. Sorry I don't gauge and don't have one of the outfits any more. Ask the child's mother for the measurements on the doll that you need while designing,which is what I need right now two also, I want to make a surprise outfit for the young girl upstairs who I know has a doll, because this is what I have done for 45 years and plan to do for allot more. I hope the suggestion is helpful. 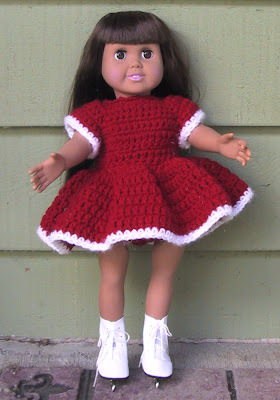 Theta Vaughn (designer for all & any dolls).